For The Music and Myth the month of June falls under the jazz-strological sign of the INNTöne Jazz Festival. The Music and Myth will be attending and covering the legendary event, held from June 6th to June 8th at the bio-farm of the equally legendary Paul Zauner in Diersbach, Austria. In the following weeks this website will hopefully (read: if all goes well) feature interviews with veteran musicians and up-and-coming talent alike. Since June is all about INNTöne, it seemed only fitting to start the month with an article about the recently released Great Voices of Harlem, a record meant to showcase the vocal prowess of Jazz-heavyweights Mansur Scott, Donald Smith and Gregory Porter. It was recorded in 2012 and released by the Austrian PAO label, owned by Zauner, whose band Blue Brass provides the instrumental backbone to this musical monograph. 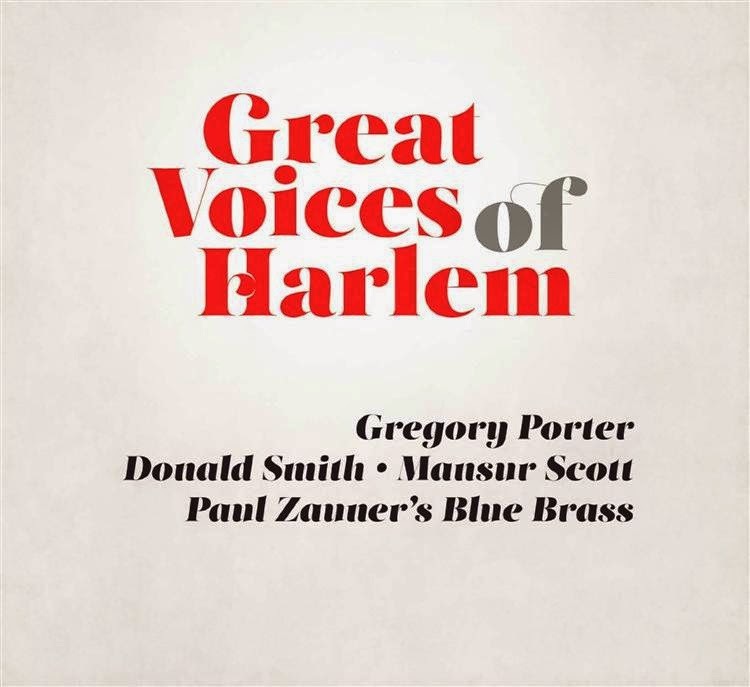 In fact, though the record is spearheaded by the name Gregory Porter – whose own Liquid Spirit was rewarded with a Grammy just this year – Great Voices of Harlem is entirely the brainchild of Zauner, a longtime aficionado of the famous New York neighborhood. The record features classics like “Moanin’”, “Somewhere over the Rainbow” “Mona Lisa” and “Watermelon Man” brought to life by the voices of the three talented vocalists, each adding his distinctive timbre and personality while maintaining a common thread of honesty and dedication. The album starts with “Moanin’”, an appropriate openening track, first because it features Porter, who is arguably the most well-known of the three, and second because its rootsy groove is sure to instantly capture the listener’s attention. Though Porter brings his usual intense delivery, the song’s highlights are the instrumental bits, especially Martin Reiter’s sprightly piano. In fact, throughout the record, the listener discovers that Blue Brass does not merely provide an instrumental background, but often steps into the foreground where it effortlessly shines, solidifying the record’s consistency (the vocalists are mostly featured individually on separate tracks). The band is such a powerful presence that you could remove the vocal parts altogether and Great Voices of Harlem would still be a thoroughly enjoyable work. The second song serves as an intro to “Peace” and, though it’s definitely enjoyable in its almost spiritual spoken-word-subtlety-over-poised-thumb-piano, it comes off as a bit out of place in the general construction of the album. Perhaps it would have been better placed towards the end of the record, where the trio of songs (the topic is continued in “Expansions”) could have created the feeling that the narrative is leading up to them. This would have been especially effective since “Peace” is not just the only song which features all three vocalists but also a superb rendition of Horace Silver’s track while “Expansions” is, in my opinion, the highlight of the record. Originally released by Lonnie Liston Smith (Donald Smith’s brother), the song is pulled off to absolute perfection. The “brass” is brilliant and hypnotic, Martin Reiter’s keyboards, Wolfram Derschmidt’s bass and Howard Curtis’ drums provide the flashy funk and Donald Smith’s delivery, complete with soulful screeches, is absolutely breathtaking. Gregory Porter returns on the next track, an elegant and moving rendition of “Somewhere over the Rainbow” where Porter’s warm voice creates a captivating contrast with the band’s wintry and wistful performance. Mansur Scott then takes the reins and provides an interesting change of pace with the gritty, impactful, spoken-word recount of “Doing Hard Time” before changing ambiance yet again to deliver one of the most emotionally expressive versions of “Stella By Starlight” this reviewer has ever heard. Smith and Scott partner up on “Watermelon Man” and somehow manage to capture both the bluesy balance of Herbie Hancock’s original and the Cuban cheer of Mongo Santamaria’s cover, while adding an entertaining touch of humor. This song is another example of the dynamic flow of the record, with constant shifts in style and mood that keep the listener alert. The album loses a bit of steam with “My One and Only Love”, if only because Donald Smith’s vocals just don’t seem to be the right fit for this particular take on the 1952 track by Guy Wood and Robert Mellin, but it quickly regains its pace with Mansur Scott’s sharp take on “Days of Wine and Roses”. In “Mona Lisa” Gregory Porter invokes the softness of Nat King Cole’s delivery to once again oppose the cold pensiveness of the band. Once more, the antithesis works wonderfully. Horace Silver’s “Song for my Father”, as performed by Mansur Scott, closes the album in an eloquent, if somewhat undistinguished manner. It feels like a bit of an odd choice for a closing track and would have definitely worked better with a different placement. Overall, Great Voices of Harlem is definitely a must-have for any knowledgeable Jazz enthusiast. The unbridled passion of Paul Zauner and the impressive combined talent of Scott, Smith and Porter transform this record from a compilation of standards into a study of the cultural significance of Jazz and a heartfelt portrayal of the soul of Harlem.